Big Santa Anita Creek is coming back after years of drought. Here’s a trailside view of the bubbling mountain stream midway between Roberts’ Camp and Sturtevant Falls. Notice the light, tea-like coloring of the water created by the leaching of tannins from last year’s fallen leaves. 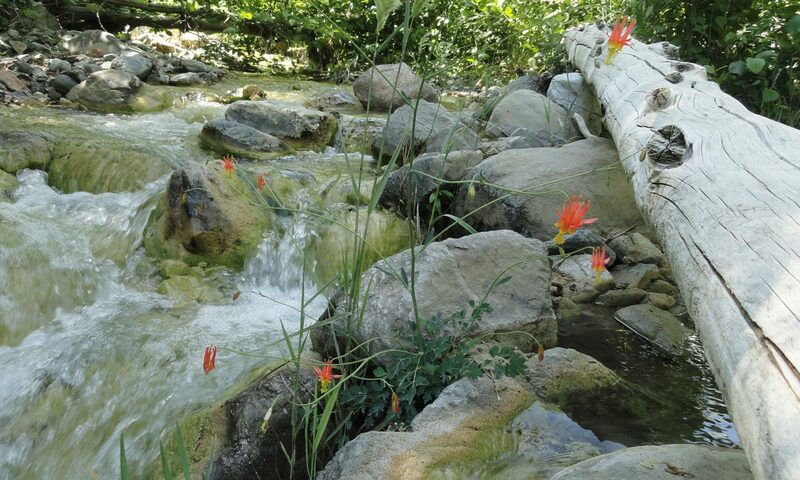 This is a great time for your Sturtevant Falls hike! The recent storms to visit Southern California have brought abundant rain and snow to the drought parched San Gabriel Mountains. 26.60″ of rain has fallen at Chantry Flats as of this writing. Measuring of the rain season begins on October 1st and concludes on September 30th of the following year, so we’re off to a good start for our winter season. All the trails radiating out of Chantry Flats lead to canyons filled with stream song. Bright green thickets of Bracken ferns grow profusely among the ledges of rocky cliffs. The Pagoda Tree with her outstretched arms, as seen here high atop Clamshell Ridge. Look for it when dropping down the road (Gabrielino Trail) from Chantry Flats to Roberts’ Camp. The watershed directly below it is McKinley Canyon, also the source of the falls photographed here in this same article. Looking down from the road that drops down from Chantry into the canyon, you can make out the gray, smokey canopy of the leafless alders hugging the boisterous mountain creek. Looking straight out (east) from San Olene Canyon, about half way down to Roberts’ Camp, the Pagoda Tree welcomes you back to the canyon. This big cone spruce stretches out its’ shaggy arms from high atop Clamshell Ridge, with a backdrop of open sky. Sturtevant Falls as seen from the Upper Falls Trail, Big Santa Anita Canyon. A recent triple-round of storms to visit Southern California brought much needed rain and snow to the San Gabriel Mountains. The Falls haven’t looked this good in over six to seven years! Right now the Big Santa Anita Canyon and Winter Creek carry, too, the scent of winter. Last autumn’s leaves mulch down into the myriad of sand and soil along the stream beds. This earthy, organic loam creates an invigorating damp scent that helps to bookmark your memories of the canyon trails and where you were all those years ago. So, when you return to Chantry for your next hike, that good wintery scent brings you back to your old haunts and all those thoughts that went along for the ride. McKinley Canyon Falls as seen from the road that descends from Chantry Flats to Roberts’ Camp. Seldom does this cliff become a waterfall. It’s been nearly seven years since this scene last occurred! McKinley Canyon is visible directly across from San Olene Canyon. Wild, steep and narrow, it drains the Clamshell Ridge watershed. When on the green footbridge at Roberts’ Camp, you cross the boisterous tumbling Winter Creek and its’ trout pools that were created by Lynn Roberts back around 1912 during the Great Hiking Era. This little creek flows down from Mt. Wilson, twisting and turning for miles, dropping approx. 4,000′ to the confluence of the Big Santa Anita’s main canyon. After leaving Roberts’ Camp, head up the main canyon, passing by the Lincoln Log style check dams. Big Santa Anita Canyon, like the Winter Creek, also begins at Mt. Wilson’s summit. Little cabins, many built over a century ago, are perched on small flats along your hike. The canopy of alder, canyon live oak and bay shade much of your way. Along with stream song, listen for the descending fluid notes of the canyon wren, a year-round resident of this watery place. In less than a couple of miles you arrive at the base of 55′ high Sturtevant Falls. The canyon big-leaf maples grace the open bowl around the plunge pool at the bottom of the falls. Leafless, their silent, bare branches seem to reach out over you, stretching and awaiting Spring. Joanie Kasten walks around a freshly fallen slide in San Olene Canyon on her way down to Roberts’ Camp. The Chantry Flats area, like all the front country of the San Gabriels have benefited greatly from the recent series of storms. While the high country is blanketed with snow, front country hiking is graced by stream song, green grasses and the flute-like song of the native canyon wrens. 55′ high Sturtevant Falls as it appears from the Upper Falls Trail, just days after the first significant storm of the new year. We received 6.61″ of rain at our gauge just downstream from the falls in the Fern Lodge area of Big Santa Anita Canyon. This is hopefully just the beginning in a series of winter storms in our current El Nino weather situation! Next time you’re considering spending a little time in the front-country of the Angeles National Forest, the Sturtevant Falls trail hike is a good one, especially since our recent rains earlier this month. Over 6 1/2″ of rain fell throughout the first week of the new year in Big Santa Anita Canyon. Ferns and mosses have sprung back to life, creating varied depths and textures of green across cliffy faces and hillsides. The song of the stream has come back, too. As you begin your descent down into the canyon, the gentle rush of the stream can be made out if it’s still and quiet, such as in the early evening. Owls and stream song mix with the cool, soft canyon breezes that make their way amongst the thickets of white alders and overarching oaks. The mild and sweet fragrance of flowering laurel bay is just around the next bend, most likely in just the next couple of weeks. When you get up next to the stream, say somewhere between Roberts’ Camp and Fern Lodge, take a moment to notice how for the first time in several years, the stream finally received enough “push” to clean out some of that dark black organic mat that’s been concealing the light colored gravel and rocks. Such a great, hopeful thing. If we get into a pattern of storms with this forecasted El Nino, then watch more and more of the dark mat wash away, exposing ever more bright sand and banded rocks. Fallen limbs and tree trunks will be washed out of the way. Pools will deepen and the sounds will once, again, change; reverberating between the rocks and cliffs of not only the Big Santa Anita, but the Winter Creek, too. The canyon wrens have already begun their bright chirping songs, mixing amongst the watery spray of our tumbling mountain brook. California newts are making their eternal slow crawl up and away from the stream, often to be found along the Gabrielino and Lower Winter Creek trails. Seems like a good time for me, too, to make my slow crawl up along the streams of our beautiful canyons.